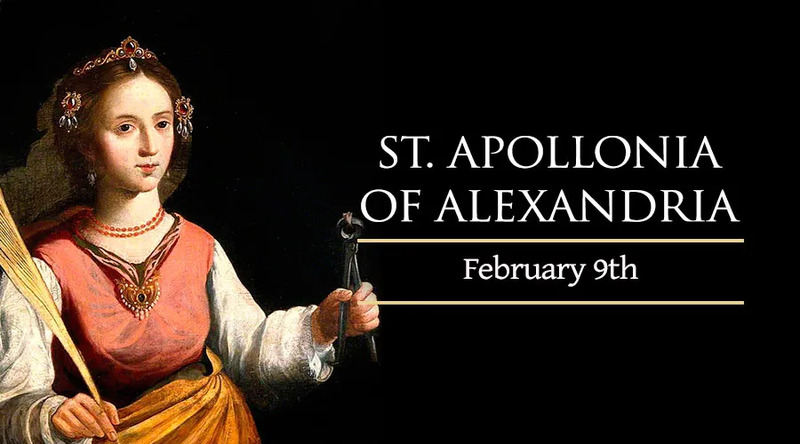 St. Apollonia was a holy virgin who suffered martyrdom in Alexandria during a local uprising against the Christians in the early 3rd century. Her martyrdom came just before the persecution of Decius (248-249). During festivities commemorating the founding of the Roman Empire, a mob began attacking Christians. Men seized her and, by repeated blows, broke all of her teeth. Then they erected a pile of sticks outside the city and threatened to burn her alive if she refused to repeat impious words after them (either a blasphemy against Christ, or an invocation of the heathen gods). When she was given a little freedom, at her own request, she sprang quickly into the fire and was burned to death. Apollonia belongs to a class of early Christian martyrs who when confronted with the choice between renouncing their faith or suffering death, voluntarily embraced the latter. She is popularly invoked for toothaches because of the torments she had to endure. She is represented in art with pincers holding a tooth.